Having only read Carey’s science fiction books, Someone Like Me was a welcome reprieve from the world of science and post-apocalyptic setting. Someone Like Me is more fantastical, more uplifting, and more to do with the fight for family. I can’t actually decide if I like the perspective of Liz, the domestic abuse survivor, or Fran, the young girl struggling with the aftermath of trauma. Both are incredibly compelling as their stories and challenges are laid bare. 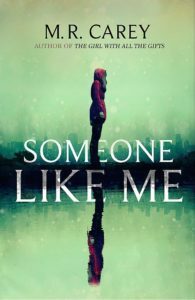 Someone Like Me is a story that is difficult to talk about without spoiling a lot of the plot – and the joy of discovery. Because there are moments that will make your jaw drop. It has all the aspects of the writing I have come to associate with Carey – a plot that never ceases to amaze you, characters who have hidden layers, and an eerieness from the very first pages – and peaks my interest even more. Unlike Carey’s previous books which, for me, revolved around the mystery of what happened in the past, Someone Like Me is taking place in the direct present. We are witnessing the events unfolding, the deterioration, the build up, in real time. We witness the twisting, the gripping reveals, and the secrets unfurling as it happens. Instead of embarking on a journey to uncover the mystery. Don’t worry, there’s still plenty of that, as the past is reluctant to give up its secrets. And that’s really all I can say before spoiling the reveals for you. This is a book about friendship and the fight for family. It’s also a book about the idea that the moments of struggle give your life perspective, make you stronger, give you something to hold on to. And forgetting it all, doesn’t actually solve anything. Find Someone Like Me on Goodreads, Amazon, Indiebound & The Book Depository.